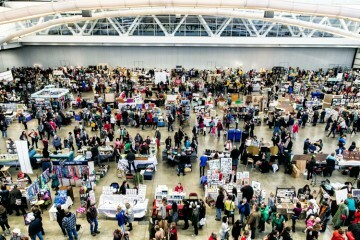 The Garbella booth at Handmade Arcade at the David L. Lawrence Convention Center. Photo by Joey Kennedy. 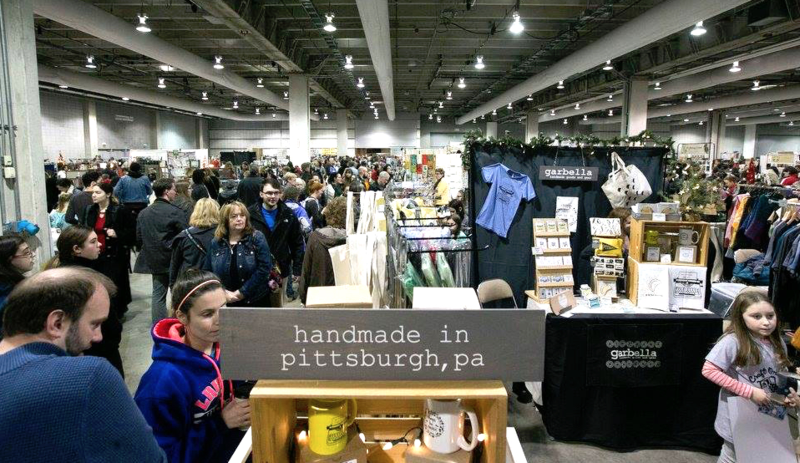 In Pittsburgh, it’s easy to fill your holiday shopping list with gifts that support local businesses and makers. We’ve got holiday markets, specialty pop-ups and plenty of spots that feature the work of local artisans. 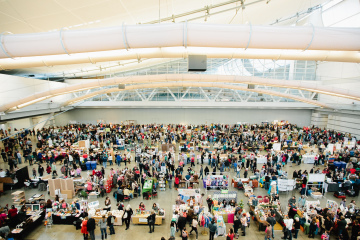 Here’s your go-to guide for Pittsburgh holiday shopping. 11 a.m. – 8 p.m. Mon. – Thurs. ; 11a.m. – 9:30 p.m. Fri. – Sat. ; 11 a.m. – 6 p.m. Sun. Inspired by the Christmas Markets that bring convivial cheer to the centers of German cities, this cluster of Alpine-style chalets has become as much a fixture of a Pittsburgh Christmas as the Spirits of Giving from Around the World at PPG Place next door. 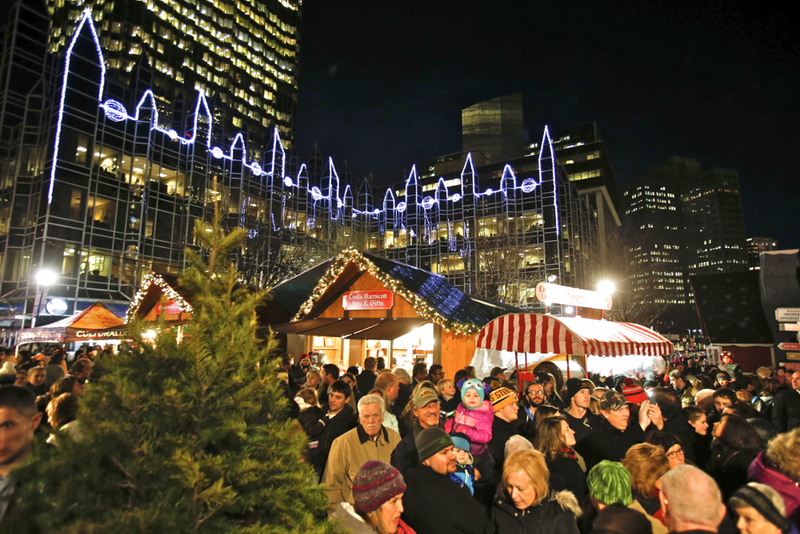 The Holiday Market features distinctive gifts, decorations and treats, made in Pittsburgh, Germany, Poland and many points in between. Click here for a list of vendors, including those who will only attend on certain days. Peoples Gas Holiday Market. Photo courtesy Pittsburgh Downtown Partnership. Just about every local museum is in on this event, where you’ll find discounts and a “special shopping experience” at museum stores around the city, and you can top off your shopping with a stroll through current exhibits. 12 p.m. – 8 p.m. Mon. – Fri.; 11 a.m. – 5 p.m. Sat. – Sun. When you can boast 100 local artists and more than 5,000 items for sale, you know you’ve got a big thing going. 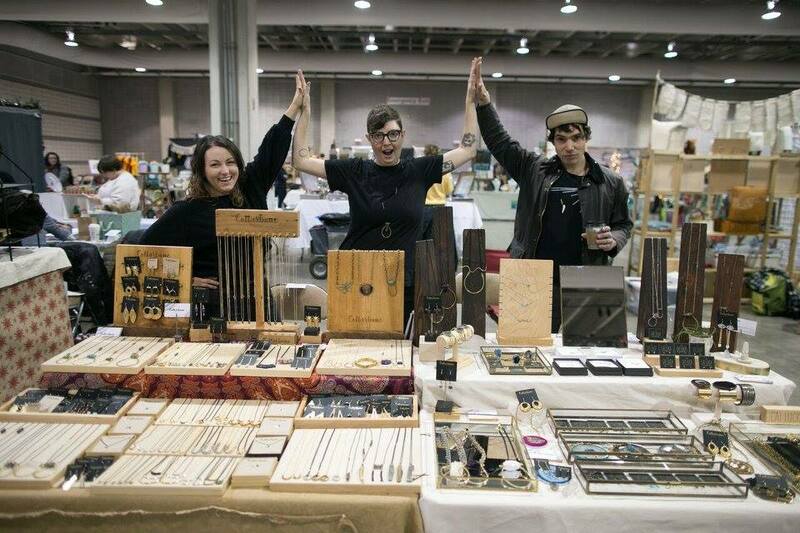 At this annual pop-up boutique, you’ll find handcrafted gifts from local artists including jewelry, ceramics, glass, weavings, knitted wears, fine art, woodcrafts, toys, cards, ornaments, edibles and more! You’ll find artists and crafters selling handmade home and holiday decor pieces, jewelry, art and clothing, with a portion of the proceeds going to local nonprofit Girls on the Run. Admission is $3 for adult and free for kids under 12. Dec. 1 – 2 at the former Macy’s building, 162 E. Bridge St., Homestead, 10 a.m. to 5 p.m.
Dec. 15 at the Block at Northway, McKnight Rd., McCandless, 10 a.m. to 5 p.m.
You’ll find a huge range of local artists, crafters, designers and makers selling handmade home goods, kids’ clothing, ceramics, bath and body supplies and artwork of all kinds. Vendors you’ll find at the Dec. 1 -2 event include jewelry maker bel monili, children’s toy maker Vampetz, fine artist Exhibit D and many more. Zeke’s Coffee Pittsburgh will be on hand to fuel your shopping spree. With more than 200 vendors, Handmade Arcade’s largest event yet features a gigantic selection of crafty gifts from do-it-yourselfers of every stripe, from local to national: organic skincare products, fashions made from recycled fabrics, contemporary photography, creepy plush dolls, glass jewelry, metalwork, even candles that smell like beer. Plus, Handmade Arcade is free to all, and always features local DJs and lots of free hands-on craft, art and tech activities for kids and adults led by local artists and arts organizations. Want a sneak peek the night before? Catch the new Cutting Edge fundraiser on Friday, Dec. 7 and shop early. Handmade Arcade. Photo by Joey Kennedy. Gorgeous and functional glass items will be for sale, including handmade art and jewelry by regional artists in various price ranges. Hot glass demonstrations happen Friday and you can make your own glass ornament on Saturday. Holiday drinks at the Hotel Monaco. 11 a.m. – 2 p.m. and 4 p.m. – 7 p.m. 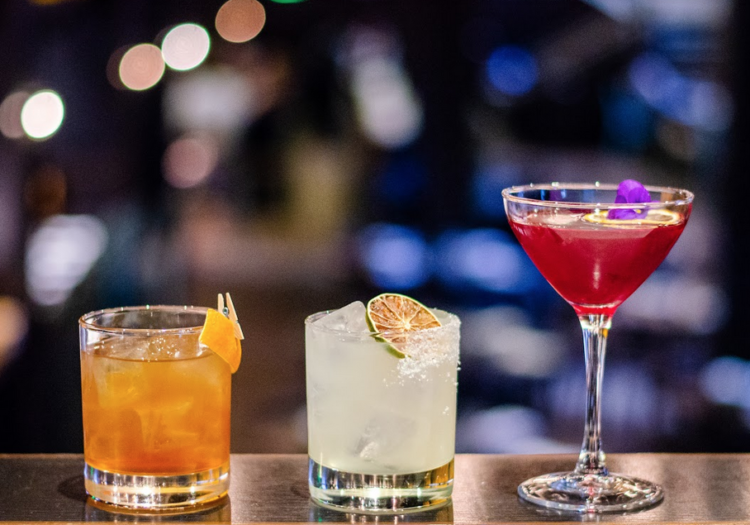 The second annual Wintermarket will offer locally made gifts from Pittsburgh area vendors, bites and cocktails from The Commoner and live holiday music by Ayesha Scott in the evenings in a winter wonderland designed by Luxe Creative. East End Brewing, 147 Julius St.
You’ll find food from La Palapa and desserts from Leona’s Ice Cream as well as an artists’ market featuring more than a dozen vendors, including garbella, Alternate Histories, Etna Print Circus and PGH Candle. East End Brewing Company Taproom. Photo courtesy of Matt Dayak. Babyland’s community of artists and thinkers are hosting their annual holiday sale, featuring woodworking, prints, jewelry, paintings, and more, plus festive food and drink. Made + Found returns to the Ace Hotel Pittsburgh for a special holiday market, expected to be bigger than ever. This show features 50 of the region’s most creative vintage and handmade vendors. Admission is free.